Works orginally produced by Art Deco artist Edouard Touraine (1883-1916). 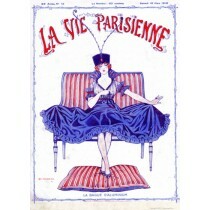 Touraine was a French Art Deco artist who illustrated for L'Illustration, Le Monde and La Vie Parisienne. His work is also found in several books published in the early 1900s. Tragically he lost his life at Verdun in 1916, fighting in World War I. Read more about Edouard Touraine in the article Edouard Touraine: Illustrator, WWI Pilot Killed in action.